Akhror Saidakhmetov is a 19-year-old would-be foreign fighter who reportedly intended to move to Syria to join ISIS in late February 2015.“Homegrown extremists,” International Security, accessed June 16, 2015, http://securitydata.newamerica.net/extremists/akhror-saidakhmetov.html. 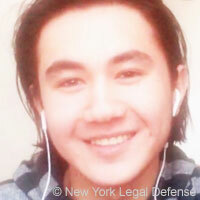 A citizen of Kazakhstan, Saidakhmetov lived in Brooklyn, New York while planning his relocation to Syria. Saidakhmetov worked for Abror Habibov, another foreign fighter who owned kiosks in several states that sold kitchenware and repaired cell phones.Jim Piggot and Scott Johnson, “Suspected ISIS terrorist arrested in Jacksonville,” News4Jax, March 7, 2015, http://www.news4jax.com/news/suspected-isis-terrorist-arrested-in-florida/31473910. Habibov agreed to assist Saidakhmetov financially in his pursuit to join ISIS in the fall or winter of 2014.Fred Barbash, “The New York arrests and a Brooklyn mother’s struggle to keep her son away from the Islamic State,” Washington Post, February 26, 2015, http://www.washingtonpost.com/news/morning-mix/wp/2015/02/26/the-new-york-arrests-and-a-brooklyn-mothers-struggle-to-keep-her-son-away-from-the-islamic-state/. Saidakhmetov and his roommate, Abdurasul Juraboev, planned to fly to Istanbul and then Syria to join ISIS. The two men intended to make the trip in late February.Aaron Katersky and Mike Levin, “ISIS: 3 New York men arrested in alleged plot to join terror group, feds say,” ABC News February 25, 2015, http://abcnews.go.com/US/WorldNews/isis-arrested-plot-join-terror-group/story?id=29222291. Saidakhemtov, however, was missing his passport for travel and needed to retrieve it from his mother, who “suspected what he was up to and had taken [it],” according to CBS News.“Men accused of plotting to join ISIS plead not guilty in Brooklyn court,” CBS, March 13, 2015, http://newyork.cbslocal.com/2015/03/13/men-accused-of-plotting-to-join-isis-due-in-brooklyn-court/. When his mother asked what he needed the passport for, Saidakhmetov admitted that he was going to Syria to join ISIS.Fred Barbash, “The New York arrests and a Brooklyn mother’s struggle to keep her son away from the Islamic State,” Washington Post, February 26, 2015, http://www.washingtonpost.com/news/morning-mix/wp/2015/02/26/the-new-york-arrests-and-a-brooklyn-mothers-struggle-to-keep-her-son-away-from-the-islamic-state/. When she would not return it to him, Saidakhmetov forged travel documents that would allow him to travel without his passport.Chris Perez, Jamie Schram, Larry Celona, and Selim Algar, “3 NYC men charged in plot to join ISIS, kill Obama: feds,” New York Post, February 25, 2015, http://nypost.com/2015/02/25/3-nyc-planning-to-join-isis-taken-into-custody-in-fbi-raid/. Saidakhmetov was arrested as he attempted to board a flight to Istanbul at JFK airport and was charged with “attempt and conspiracy to provide material support to ISIL,” according to the criminal complaint.“Three Brooklyn, New York, resients charged with attempt and conspiracy to provide material support to ISIL,” United States Department of Justice, February 25, 2015, http://www.justice.gov/opa/pr/three-brooklyn-new-york-residents-charged-attempt-and-conspiracy-provide-material-support. Juraboev was arrested, as he planned to follow Saidakhmetov to Syria the following month, as well as Habibov, who funded both of their trips.Richard Serrano, “3 arrested in U.S, charged with trying to aid Islamic State,” LA Times, February 25, 2015, http://www.latimes.com/nation/la-na-brooklyn-terror-isis-arrests-20150225-story.html. In March 2015, he pled not guilty along with the other two men accused.Stephanie Clifford, “3 Brooklyn men accused of plotting to aid ISIS plead not guity,” New York Times, March 13, 2015, http://www.nytimes.com/2015/03/14/nyregion/3-brooklyn-men-accused-of-plotting-to-aid-isis-plead-not-guilty.html. Saidakhmetov had previously expressed jihadist tendencies online and to his co-conspirators.Catherine Shoichet, Ed Payne, and Ray Sanchez, “3 men try to join ISIS: here's what we know,” CNN, February 26, 2015, http://www.cnn.com/2015/02/26/us/new-york-terror-plot-suspects/. He commented on an ISIS video online showing the execution of Iraqi soldiers, writing that it made “[his] eyes joyful.”“UNITED STATES OF AMERICA against ABDURASUL HASANOVICH JURABOEV, also known as “Abdulloh Ibn Hasan,” AKHROR SAIDAKHMETOV, and ABROR HABIBOV, Defendants.,” United States Department of Justice, February 24, 2015, http://www.justice.gov/file/344761/download. He originally planned to join the American military with the intention of providing information to ISIS. If that failed or he was caught, he “could always open fire on American soldiers and kill as many as possible,” according to the criminal complaint.Catherine Shoichet, Ed Payne, and Ray Sanchez, “3 men try to join ISIS: here's what we know,” CNN, February 26, 2015, http://www.cnn.com/2015/02/26/us/new-york-terror-plot-suspects/. He spoke of purchasing a machine gun to “go out and shoot all police” and attack the FBI.Phillip Swarts, “3 arrested in N.Y, Florida, in plot to join Islamic State,” Washington Times, February 25, 2015, http://www.washingtontimes.com/topics/akhror-saidakhmetov/. Saidakhmetov also planned to hijack an airplane on its way to Turkey and fly it to Syria in order to provide ISIS with an airliner.Chris Perez, Jamie Schram, Larry Celona, and Selim Algar, “3 NYC men charged in plot to join ISIS, kill Obama: feds,” New York Post, February 25, 2015, http://nypost.com/2015/02/25/3-nyc-planning-to-join-isis-taken-into-custody-in-fbi-raid/. Discussing travel routes with the undercover agent: “America is catching, they are very strict now. … it is better to fool them by flying here and flying there.”Catherine Shoichet, Ed Payne and Ray Sanchez, “3 men try to join ISIS: here's what we know,” CNN, February 26, 2015, http://www.cnn.com/2015/02/26/us/new-york-terror-plot-suspects/. “If a person has a chance to join the Islamic State and does not go there, on Judgment Day he will be asked why, and it is a sin to live in the land of infidels.”Marc Santora and Nate Schweber, “In Brooklyn, eager to join ISIS, if only his mother would return his passport,” New York Times, February 26, 2015, http://www.nytimes.com/2015/02/27/nyregion/isis-plot-brooklyn-men.html. “We will go and purchase one handgun … then go and shoot one police officer. Boom. … Then, we will take his gun, bullets and bulletproof vest … then, we will do the same with a couple of others. Then we will go to the FBI headquarters, kill the FBI people.”Catherine Shoichet, Ed Payne, and Ray Sanchez, “3 men try to join ISIS: here's what we know,” CNN, February 26, 2015, http://www.cnn.com/2015/02/26/us/new-york-terror-plot-suspects/. Saidakhmetov tells his informant of his plans if he cannot get to Syria: “It is legal in America to carry a gun. I will just go and buy a machine gun, AK-47, go out and shoot all police.”Phillip Swarts, “3 arrested in N.Y, Florida, in plot to join Islamic State,” Washington Times, February 25, 2015, http://www.washingtontimes.com/topics/akhror-saidakhmetov/. In reference to his planned trip to Syria: “go there [to] become a Mujahid on the path of Allah.”“UNITED STATES OF AMERICA against ABDURASUL HASANOVICH JURABOEV, also known as “Abdulloh Ibn Hasan,” AKHROR SAIDAKHMETOV, and ABROR HABIBOV, Defendants.,” United States Department of Justice, February 24, 2015, http://www.justice.gov/file/344761/download. On watching “Upon the Prophetic Methodology,” an ISIS video that depicts mass executions of Iraqi troops: “Allohu Akbar I was very happy after reading this, my eyes joyful so much victory.”“UNITED STATES OF AMERICA against ABDURASUL HASANOVICH JURABOEV, also known as “Abdulloh Ibn Hasan,” AKHROR SAIDAKHMETOV, and ABROR HABIBOV, Defendants.,” United States Department of Justice, February 24, 2015, http://www.justice.gov/file/344761/download.